Sep 12: Join Us for the Moral Day of Action! Join us for the “Moral Day of Action” in Richmond on Monday, September 12! On Saturday, August 13, we made history in Richmond. Thousands and thousands of us marched through the streets of Richmond to demand economic justice for the 64 million Americans working for less than $15 an hour. The march brought together people from across the country working too much for too little – from Kroger associates to fast food workers to childcare providers and even college professors. Now, we’re taking our message to Virginia legislators. On Monday, September 12, we’re rallying to call on the governor, state legislators and candidates for office to move away from extremist politics and policies that benefit the few and move toward policies and laws that are just and fair and guarantee a better life for the majority of the people. As we rally in Richmond, simultaneous rallies will be held at state capitals throughout the country as part of a national Moral Day of Action. Join us! On Monday, September 12, 2016 at State Capitols around the nation, at 11 AM in every time zone, justice will roll across the country as faith leaders from diverse traditions, people impacted by poverty, racism, and injustice, advocates, and activists come together rally and to deliver to our elected leaders and candidates the Higher Ground Moral Declaration, which calls on governors, senators, state legislators and candidates for office to move away from extremist politics and policies that benefit the few and move toward policies and laws that are just and fair and guarantee a better life for the majority of the people. The Moral Declaration that has already been delivered to the RNC as well as the DNC will be read, proclaimed, and delivered to our Governors, US Senate candidates and state party officials. The format will be simple and will be the same in every state. The Moral Day of Action on Monday is part of “The Revival: Time for a Moral Revolution of Values,” a national tour to redefine morality in American politics and challenge leaders of faith and moral courage to be more vocally opposed to harmful policies that disproportionately impact the poor, people who are ill, children, immigrants, communities of color, and religious minorities. The first part of the national revival tour has over 19 stops from April 2016 to January 2017 including New York, North Carolina, Georgia, Alabama, Texas, Mississippi, Ohio, Pennsylvania, Massachusetts, South Carolina, Wisconsin, Missouri, Washington DC, Tennessee, Indiana, Minnesota, New Mexico, Kentucky, and Virginia. The Revival is co-led by the Rev. Dr. James A Forbes Jr. and the Rev. Dr. William J. Barber II, architect of the historic Moral Monday Movement in North Carolina. They will be joined in some states by other national social justice leaders, including the Rev. Dr. Traci Blackmon, acting executive minister of the United Church of Christ’s Justice and Witness Ministries, and Sister Simone Campbell, leader of the “Nuns on the Bus” and executive director of the Catholic social justice lobby NETWORK in Washington, DC. On Saturday, August 13, we made history in Richmond. Thousands and thousands of us marched through the streets of Richmond to demand economic justice for the 64 million Americans working for less than $15 an hour. The march brought together people from across the country working too much for too little – from Kroger associates to fast food workers to childcare providers and even college professors. The march culminated the first-ever national Fight for $15 convention, which brought together thousands of underpaid workers to strategize next steps for our growing movement. The Fight for $15 movement shows us what we can accomplish when we stand together. It all started four years ago when fast food workers in New York went on strike. Since then, it has grown to thousands of cities across the world and has scored victory after victory for working people. Just last month, we passed legislation to raise the minimum wage in Washington, D.C. to $15 an hour by 2020. New York and California have already done the same thing. Seattle, San Francisco, Los Angeles have also gone to $15. It’s time for an economy that works for us ALL. It’s time for $15 and union rights. We are thousands strong, and we are tired of struggling to get by no matter how hard we work. We deserve better. We know that by standing together, we’ll get the better lives we deserve. Check out photos from the march on Facebook. On Saturday, August 13, thousands of people like us will be marching through the streets of Richmond calling for a $15 minimum wage and union rights. Can you make it? The Fight for $15 has grown to become a household name in our country for a reason. Thousands of hardworking men and women have refused to stay silent about the challenges of making ends meet on today’s poverty wages. Just look at the facts. Nearly 64 million Americans work for less than $15 an hour, including many members of Local 400. Over the last few decades, the real value of our wages has plummeted. Today, the minimum wage in Virginia is only $7.25. But in 1968, it was $1.60 –equivalent to $11.08 today. Not only that, we’re more productive today than we were in 1968. If the minimum wage kept pace with our productivity, it would be $18.85 today! Even if you make more than the minimum wage, your pay is affected too. When the value of the minimum wage goes down, so does the value of your paycheck. It’s simple: the lower the bottom goes, the deeper we all sink. That’s why we’re fighting to raise wages up and down the scale – because like the saying goes, a rising tide lifts all boats. It’s not that Kroger can’t afford to pay more. Kroger made $2.4 billion in profits last year. Kroger’s CEO, Rodney McMullen, was richly rewarded for your hard work: he got a 17% pay raise this year. He now makes $11.2 million a year. A part-time Kroger associate making $9 an hour would have to work 1,204 years to make what he made last year alone. We’re tired of CEOs getting all of the reward off of our hard work while we struggle to make ends meet. We’re tired of working harder than ever but earning less than we did decades ago. It’s time for change. Join us on Saturday, August 13, for a historic Fight for $15 march through Richmond. We’ll be marching with thousands of McDonald’s cashiers and airport baggage handlers, truck drivers and early education teachers, retail employees and home care workers. And so many others. To those of you that doubt us, those of you that think we’ll never get $15 an hour (or worse, think that we don’t deserve $15 an hour) – think again. We’re already doing it. Just last month, we passed legislation to raise the minimum wage in Washington, D.C. to $15 an hour by 2020. New York and California have already done the same thing. Seattle, San Francisco, Los Angeles have also gone to $15. This isn’t just a fight worth winning, it’s a fight we ARE winning. Help us keep up the momentum! Join us on Saturday, August 13 to Fight for $15 at Kroger! The Virginia Senate Commerce and Labor Committee ignored the voices of working Virginians and once again struck down a proposal to increase the state’s minimum wage, currently a paltry $7.25 per hour. Monday, February 1, dawned unusually warm as a team of UFCW Local 400 activists walked from the Richmond Marriott to the state legislature to participate in this year’s “Lobby Day” activities. Each General Assembly session, the Virginia AFL-CIO invites activists from various labor unions to help make the case to lawmakers for that year’s labor agenda. Many Virginia legislators, Democrat and Republican, are determined that the state’s “right-to-work” law wind up in the Constitution of Virginia. They passed that measure last year, and would like to see it pass in 2016 and be on the ballot this fall. Her questions were met with silence. Once again, the GOP-controlled Virginia legislature was refusing to respond to the needs of hardworking men and women struggling to make ends meet. Nevertheless, it was an opportunity to show our presence as an organized labor force in a state long run by businessmen. Some legislators, including Sen. John Edwards, Del. Charniele Herring, Del. David Toscano, and Del. Jeion Ward, met with our delegation and we had the opportunity to thank them for their long support of organized labor. The fight against “right to work” and the struggle to raise the minimum wage will continue in Virginia, and UFCW Local 400 will be there! UFCW Local 400 staff and members were out in force at the Virginia General Assembly as part of the AFL-CIO’s annual lobby day. Rick Howell, pictured on the left, is a UFCW Local 400 member from Roanoke, Virginia, where he has worked for Kroger for many years. Rick is also a writer and journalist. You can read his regular column in The Bedford Bulletin. Last year, Local 400 and its labor allies succeeded in raising the minimum wage in Maryland, Washington, D.C., and West Virginia, leaving Virginia lagging behind at $7.25/hour. 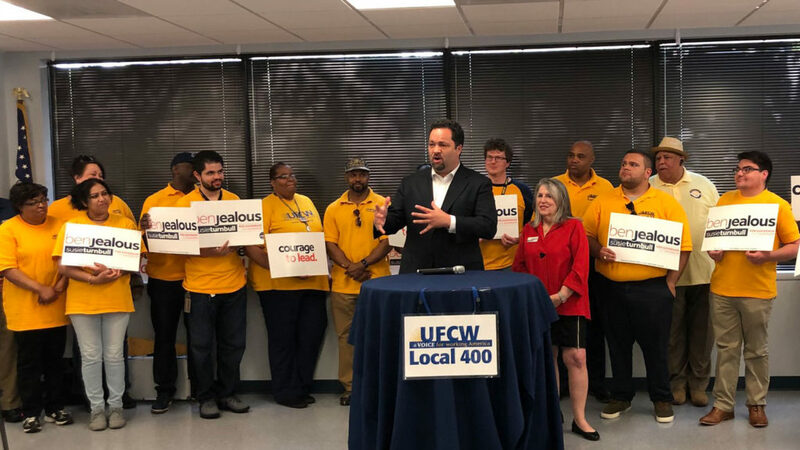 To get Virginia’s living standards closer to the level of its neighbors, Local 400, the Virginia AFL-CIO and many other state advocacy groups joined together in the #payVA campaign, backing legislation sponsored by Sen. David Marsden (D-Fairfax) and Del. Ken Plum (D-Fairfax) to lift the minimum wage to $10.10/ hour by 2017. A similar bill passed the Virginia Senate last year on a 20-20 party-line vote, with Lt. Gov. Ralph Northam breaking the tie in its favor, but it was defeated in the Republican-controlled House. This year, the Virginia Senate is controlled by Republicans 21-19 after the scandal-tainted resignation of Sen. Phil Puckett. Yet despite having only a one vote margin, Senate Republicans stacked the Commerce and Labor Committee with 11 of their members to only three Democrats. So when the committee considered Sen. Marsden’s minimum wage bill, it was defeated on a party-line vote, 11-3. Del. Plum’s bill was also voted down in the House Commerce and Labor Committee. Local 400 members are out in force battling for a higher minimum wage. Activists have been in stores getting signatures on cards for the General Assembly and recruiting volunteers. And members have come to the state Capitol in Richmond to participate in the Virginia AFL-CIO lobby day and to testify at committee hearings on the bill.